The spectrum of glycosphingolipids (GSL*) to be found on the outer surface of essentially every animal cell is exquisitely sensitive to that cell’s general biological status; it reflects whether the cell: comes from an insect or a mammal from a brain or from the blood and whether that cell is benign or malignant (1). The neutral glycosphingolipids as well as their acidic counterparts, the sulfatides and the gangliosides, all contribute to the cell surface’s biological and immunological identity. In most of the papers included in this volume very specific questions have been asked of transformed cells. Issues such as to the presence or absence of growth factor receptors on cells as well as the kinetic parameters of such receptors are certainly of importance for an understanding of malignant growth. Our approach, however, has been of a more general nature. 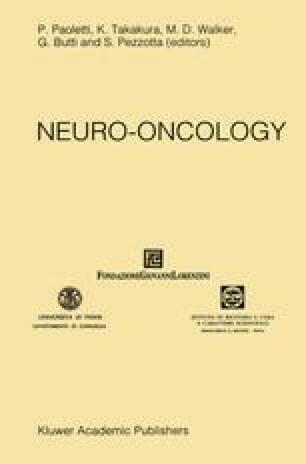 We have restated and refined the question of how the glycosphingolipid composition of nervous tissue changes as tumors develop (2), and in particular, whether these changes could be exploited to increase the accuracy in the histological diagnoses of stereotactically removed brain tumor biopsies weighing less than a milligram.